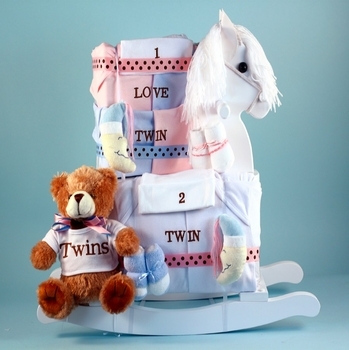 Here is a delightful baby gift for twins featuring a wooden rocking horse with a plush teddy bear and some beautiful layette essentials in pink or blue colors for two boys, girls or one of each! Please click on More Images above to see the all blue and pink versions. The babies will surely enjoy playing with the teddy bear and riding their sturdy little rocker as they grow. The rocking horse boasts all wood construction with a white painted finish with a soft yarn mane. The plush bear is wearing a little tee shirt emblazoned with "twins" too. For the new arrivals we include some super cute baby outfits with a 'twins' design to keep them snug and comfortable day and night. All are very high quality and completely made in the USA with the finest cotton fabric and attention to detail. Please specify the babies� genders when ordering to determine the combination of pinks or blues. The entire collection is then carefully gift wrapped in white tulle for a lovely presentation to the new parents and we�ll ship it to them for free!